Changes in the ways in which people in Powys transport themselves around the county and beyond are very clear to see between 1891 and 2002. The railways had bought huge changes to the distances and frequency of travel in 1891 and we look at the dramatic effect that it brought to one Powys town in particular - Brecon. Not only did it transport people and goods but it brought massive employment to the town. Who worked on the trains, on the tracks and in the engine sheds; at the station and in the railway headquarters? In total contrast, how had the railways affected our 2002 diarists, in days when the railways no longer reaches Brecon? How has road travel changed? How important was the horse to transport in 1891 compared to the massive impact that the car has had on modern life? How would a modern day farrier have compared to a Victorian blacksmith ? We look at the ways in which people use their cars, and also buses. 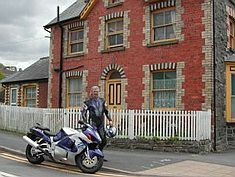 How do Powys children get to school now compared to 1891? As far as other means of transport are concerned we look at canals - how they had declined for commercial use even in 1891 but are enjoyed for leisure today just as they were then. We look at the bicycles - still a relatively new and expensive pursuit in 1891 but still being used for transport today by some people. Finally, what of air travel? Virtually non-existent in 1891, save for the sometimes disastrous attempts at hot air ballooning, how has air travel transformed the mobility of Powys residents?